This baseball season marks the 40th anniversary of the New York Yankees winning the 1978 World Series. Baseball fans can surely recall some of the legendary names from that team, including Reggie Jackson, Goose Gossage, Ron Guidry, Catfish Hunter, Willie Randolph, Bucky Dent, Chris Chambliss, Graig Nettles, Thurman Munson and Mickey Rivers. But there’s one memorable name that you might not be able to recall as easily, and that’s “Disco Dom” Scala. Though maybe not as recognizable as some of the others, Scala played an integral role in the Yankees’ world championship season as the team’s bullpen catcher. Scala grew up in Williamsburg and attended Annunciation Elementary School there. He played his CYO sports at Our Lady of Mount Carmel, Williamsburg. From there, it was on to St. Francis Prep, Williamsburg, where he played football, basketball and baseball. He was a tight end/defensive end on Coach Vince O’Connor’s L’il Terriers football teams, a forward on the basketball court and a third baseman/first baseman on the baseball diamond. He took his baseball talents to St. John’s University, Jamaica, where he suited up for a few more local coaching legends: Jack Kaiser and Joe Russo. Scala started at first base and batted cleanup as a freshman – a seemingly unheard of feat in those days. He shifted to third base his sophomore through senior seasons. The Oakland Athletics selected Scala in the ninth round of the 1976 MLB draft. He began as a third baseman but moved to catcher his second year, since there was a better chance to advance through the A’s system from behind the plate. After playing two seasons in the A’s minor leagues, Scala was released on the final day of spring training in 1978. He came back home to New York, since other teams were not looking for personnel with the season about to start. A few weeks later, he received a call from the Yankees asking him to be their bullpen catcher. Though he said he would have rather continued his playing career, Scala accepted the job, with the provision that if anything happened to the team’s other catchers, he’d be given a fair shot to fill in. Throughout the season, Scala worked out with the team, took and threw batting practice and led the players during infield drills. He then was responsible for warming up the pitchers in the bullpen to get them ready for their starts or to come into the game in relief. He never got the chance to play, but he was beyond thrilled to be part of a World Series championship team and a winning tradition in the Bronx. At the time, there were only two bullpen catchers in the entire league: Scala and Mark Cresse of the Los Angeles Dodgers – the team the Yankees beat in the fall classic. Today, each MLB team has a bullpen catcher, with some teams even having two. Scala took on the role of being another coach on the field. He also kept the atmosphere light, since he was still one of the guys. Late Yankees outfielder Paul Blair coined the nickname “Disco Dom,” since Scala enjoyed going to disco clubs in the ’70s and loved to dance. The euphoric feeling continued when Scala received his World Series ring, presented to him on his birthday by Bucky Dent, who, of course, is best known for hitting a go-ahead three-run home run in the 1978 divisional tiebreaker game against the hated rival Boston Red Sox and then winning the M.V.P. of that year’s World Series. 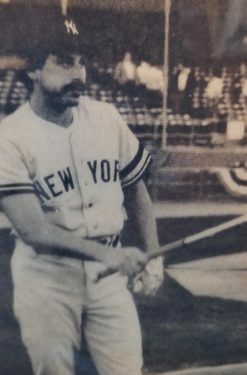 In 1979, Scala was invited to Yankees’ spring training but was sent to the minors. He was given the option to be the bullpen catcher again, and he accepted, hoping it could lead to a career in coaching. Since then, he’s never looked back. He served as bullpen catcher for the Yankees through the 1986 season. He was then an advance scout for the Pittsburgh Pirates for three seasons before returning to New York as an assistant coach for St. Mary’s H.S., Manhasset, L.I. 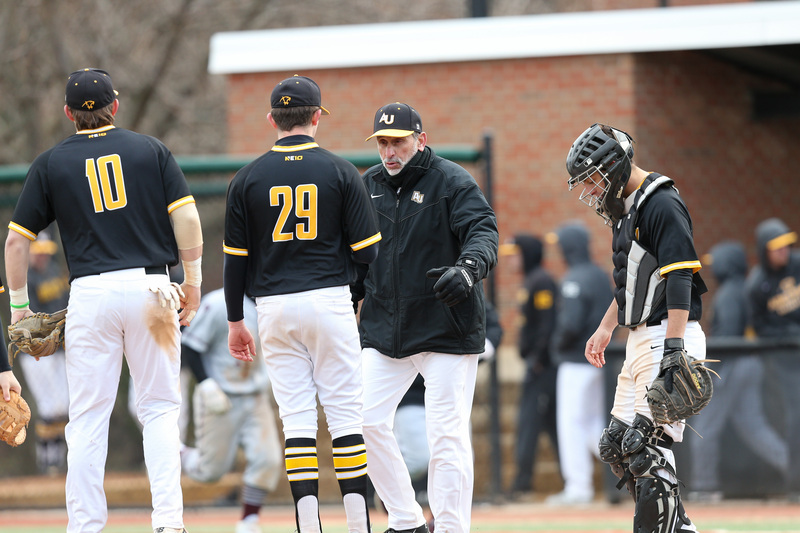 Scala was appointed head baseball coach at Adelphi University, Garden City, L.I., in 2003. He takes what he learned from his time with the Yankees to mold his student-athletes into students of the game. “It was just so instrumental,” he said. “I’ve been around so many great players, managers, general managers and coaches. I tried to take a little piece from everybody and put it in my head and make my own decisions from that. The current Adelphi Panthers are too young to remember the likes of Reggie Jackson, Goose Gossage, Ron Guidry and Thurman Munson from the ’78 Yankees. So instead they turn to “Disco Dom” to learn about what it means to be a good teammate and to be part of a tradition of winning and playing the game correctly. In that regard, “Disco Dom” doesn’t disappoint! Great article about a really great person.